Objective To investigate the association of neonatal hypoglycaemia and hyperglycaemia with outcomes in infants with hypoxic ischaemic encephalopathy (HIE). Design Post hoc analysis of the CoolCap Study. Setting 25 perinatal centres in the UK, the USA and New Zealand during 1999–2002. Patients 234 infants at ≥36 weeks’ gestation with moderate-to-severe HIE enrolled in the CoolCap Study. 214 (91%) infants had documented plasma glucose and follow-up outcome data. Intervention Infants were randomised to head cooling for 72 h starting within 6 h of birth, or standard care. Plasma glucose levels were measured at predetermined time intervals after randomisation. Main outcome measure The unfavourable primary outcome of the study was death and/or severe neurodevelopmental disability at 18 months. 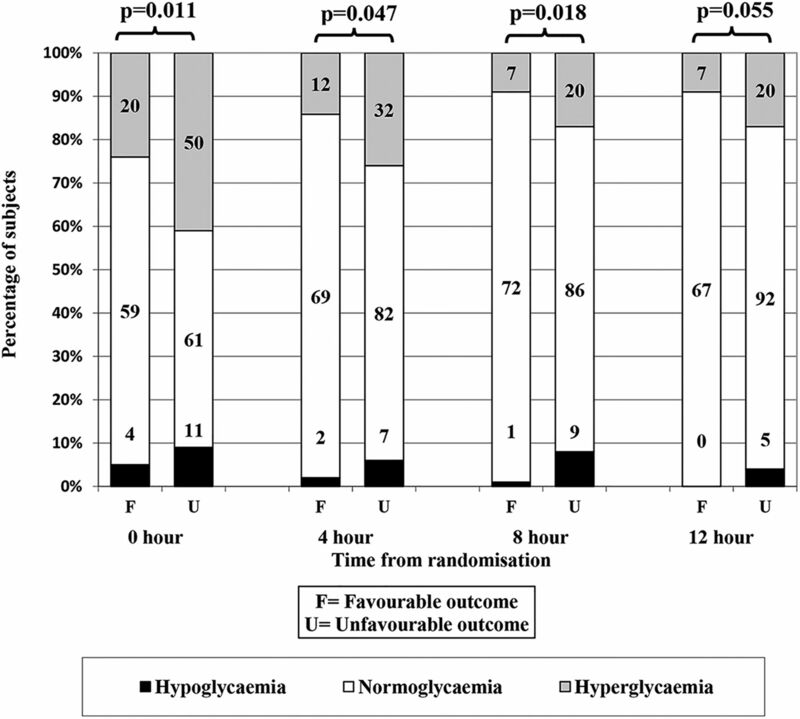 Hypoglycaemia (≤40 mg/dL, ≤2.2 mmol/L) and hyperglycaemia (>150 mg/dL, >8.3 mmol/L) during the first 12 h after randomisation were investigated for univariable and multivariable associations with unfavourable primary outcome. Results 121 (57%) infants had abnormal plasma glucose values within 12 h of randomisation. Unfavourable outcome was observed in 126 (60%) infants and was more common among subjects with hypoglycaemia (81%, p=0.004), hyperglycaemia (67%, p=0.01) and any glucose derangement within the first 12 h (67%, p=0.002) compared with normoglycaemic infants (48%) in univariable analysis. These associations remained significant after adjusting for birth weight, Apgar score, pH, Sarnat stage and hypothermia therapy. Conclusions Both hypoglycaemia and hyperglycaemia in infants with moderate-to-severe HIE were independently associated with unfavourable outcome. Future studies are needed to investigate the prognostic significance of these associations and their role as biomarkers of brain injury. Trial registration number (ClinicalTrials.gov NCT00383305). Postnatal deranged glucose homeostasis is common in infants with hypoxic ischaemic encephalopathy; the relationship with long-term outcome is unclear. Previous studies have found univariable associations with hypoglycaemia and hyperglycaemia and long-term outcome, but not after multivariable analysis. This study reports that hypoglycaemia and hyperglycaemia during the early postnatal period in infants with hypoxic ischaemic encephalopathy are associated with unfavourable outcome at 18 months. These associations remained significant after adjusting for birth weight, Apgar score, pH, Sarnat stage and hypothermia therapy. The odds of an unfavourable outcome were higher in infants with hypoglycaemia (OR 6.2), hyperglycaemia (OR 2.7) and any glucose derangement (OR 3) compared with normoglycaemic infants. Hypoxic ischaemic encephalopathy (HIE) is one of the most serious perinatal complications and remains associated with a high risk of death or long-term neurodisability. Despite advances in obstetric care, moderate-to-severe HIE affects 1.5–3 per 1000 term live births in developed countries.1 ,2 There is now compelling evidence that mild hypothermia induced within 6 h after resuscitation can improve long-term survival without disability.3 However, many infants still die or survive with disability, and recent data suggest that longer or deeper cooling did not reduce death at hospital discharge.4 Thus, it is important to investigate whether other factors may help to further optimise care. Glucose is the primary substrate for energy metabolism in the newborn brain, and deranged metabolism may contribute to neuronal injury.5 ,6 At birth, the continuous transplacental infusion of glucose ends; normal postnatal glucose homeostasis then depends on hepatic glycogen reserves, hormonal regulation and external provision of enteral or parenteral substrate. Hypoglycaemia and hyperglycaemia occur frequently in infants with HIE, likely due to the profound metabolic and hormonal disturbances.7–9 Their effect on long-term outcome is unclear. Although one study found that early hypoglycaemia was a risk factor for short-term perinatal brain injury in newborns with HIE,9 others did not find a relationship between early hypoglycaemia and adverse neurodevelopmental outcome at 24 months age after adjusting for HIE severity.7 Two retrospective studies reported conflicting results on the association between early hyperglycaemia and unfavourable outcome in infants with HIE.7 ,10 Thus, there is no conclusive evidence that deranged glucose metabolism in infants with HIE is independently associated with unfavourable long-term neurological outcome. 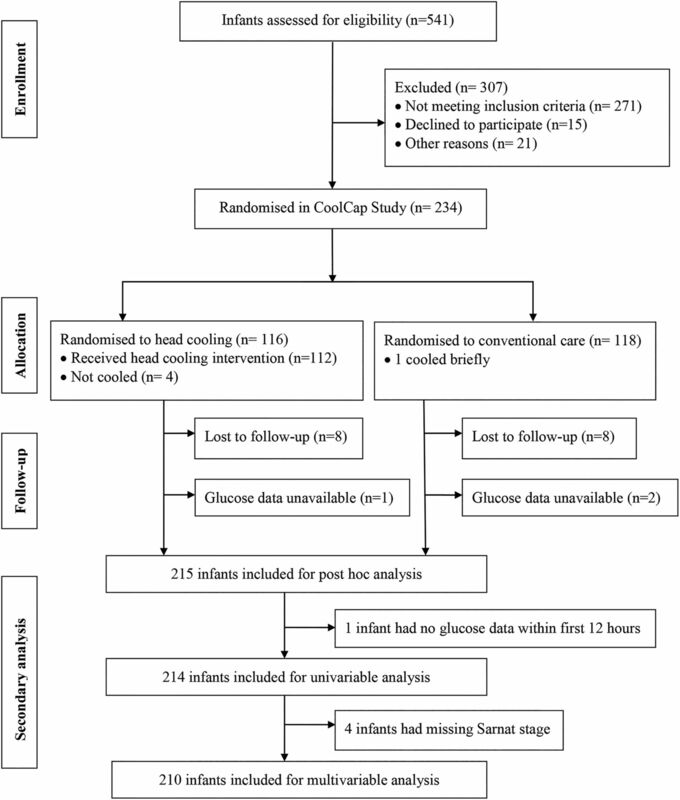 The CoolCap Study was a multicentre randomised controlled study of selective head cooling and mild systemic hypothermia for the treatment of perinatal moderate-to-severe HIE in 234 infants at ≥36 weeks’ gestation enrolled between 1999 and 2002.18 This study was performed in 25 perinatal centres using a trial design registered with the US Food and Drug Administration under the Investigational Device Exemption/Premarket Approval programme. Study subjects were randomised to head cooling for 72 h starting within 6 h of birth, with rectal temperature maintained at 34.5±0.5°C, followed by rewarming over 4 h or standard care at 37.0±0.5°C. The primary unfavourable study outcome was death or severe disability (ie, gross motor function classification system level 3–5, Bayley scales of infant development II mental developmental index <70 or bilateral cortical visual impairment) at 18 months. CoolCap Study subjects were eligible (n=215, 92%) for the current analysis if they completed follow-up evaluations, and plasma glucose values were available in the database (figure 1). Flow of infants through the trial. Demographic, obstetric and neonatal parameters were stratified by primary outcome (favourable vs unfavourable) and compared using χ2 test, Fisher's exact test, t test or Wilcoxon rank-sum test as appropriate. Episodes of hypoglycaemia, normoglycaemia and hyperglycaemia as single or recurrent occurrences during the first 12 h were documented for all subjects. Multiple logistic regression models were built to investigate the association between deranged glucose values and an unfavourable outcome. Covariates with p<0.1 from univariable analysis were included a priori in the multiple regression models. Statistical significance for the final models was assessed at the 0.05 level, and no adjustment was made for multiple hypothesis testing in this exploratory analysis. Statistical analysis was conducted using Stata V.12.1 (StataCorp LP, College Station, Texas, USA). Study demographic data stratified by 18-month outcome are shown in table 1. Infants with an unfavourable outcome were generally larger, less likely to have been cooled, had more severe versus moderate HIE, had lower 5 min Apgar scores and were more acidotic. Incidentally, only four study infants had septicaemia. Therefore, meaningful statistical associations between septicaemia and glucose derangements and outcome could not be established. The time period after randomisation that was most informative for predicting an unfavourable outcome was during the first 12 h. At the time of randomisation, of infants with recorded plasma glucose levels, 7% (15/205) were hypoglycaemic and 34% (70/205) were hyperglycaemic. During the first 12 h, 13% (27/214) of infants had at least one episode of hypoglycaemia, 48% (102/214) had at least one episode of hyperglycaemia and 57% (121/214) had ≥1 episode(s) of hypoglycaemia or hyperglycaemia (table 2). Of 207 infants who had ≥1 glucose values obtained during the first 12 h, 30% had ≥2 deranged values and 8% had both hypoglycaemia and hyperglycaemia. The incidence of hypoglycaemia and hyperglycaemia progressively decreased over time during the 72 h study period. Later (>12 h after randomisation) glucose derangements were not associated with outcome. At the time of randomisation, 9% and 41% of infants with unfavourable outcome had hypoglycaemia or hyperglycaemia, respectively, compared with 5% and 24% of infants with favourable outcome (p=0.011). Derangements of glucose at 4 and 8 h were significantly more common in infants with unfavourable outcome (figure 2). Distribution of glucose values at each time point during the first 12 h stratified by favourable versus unfavourable primary outcome. Y-axis depicts percentage of subjects with hyperglycaemia, normoglycaemia and hypoglycaemia at each time point. The n is reported in the columns. Infants with at least one episode of hypoglycaemia during the first 12 h were more likely to have an unfavourable outcome. Among the 27 infants with hypoglycaemia within 12 h, 22 (81%) had an unfavourable outcome at 18 months of age compared with only 48% of infants with normoglycaemia (p=0.004, table 2). Infants with at least one episode of hyperglycaemia during the first 12 h were also more likely to have an unfavourable outcome. Among the 102 infants with hyperglycaemia within 12 h, 68 (67%) had an unfavourable outcome, significantly higher than normoglycaemic infants (p=0.01, table 2). Recurrent hypoglycaemia (>1 episode within the first 12 h) was present in only 11 (5%) of the infants; 82% of these infants had an unfavourable outcome compared with 48% among normoglycaemic infants (p=0.052, table 2). Recurrent hyperglycaemia (>1 episode within the first 12 h) was noted in 19% (39/207) of the infants; 77% of these infants had an unfavourable outcome compared with 48% among infants with normoglycaemia (p=0.002, table 2). Glucose derangements were significant independent predictors of unfavourable outcome after adjusting for birth weight, hypothermia therapy, Sarnat stage (III vs II), Apgar score at 5 min and first pH (table 3). The odds of an unfavourable outcome were 6.2 times greater among infants with at least one episode of hypoglycaemia, 2.7 times greater among infants with at least one episode of hyperglycaemia and three times greater in those with at least one episode of any glucose derangement (hypoglycaemia or hyperglycaemia) within the first 12 h compared with normoglycaemic infants. Infants with recurrent hypoglycaemia (5% of infants, OR 2.1, 95% CI 0.52 to 8.3) and recurrent hyperglycaemia (19% of infants, OR 4.5, 95% CI 1.7 to 12.0) had an increased incidence of unfavourable outcome (82% and 77%, respectively), although the number of newborns with recurrent glucose abnormalities was small. There are very limited data describing hyperglycaemia in neonates outside of sick extremely premature infants or due to iatrogenic causes, and its relationship with outcome is not clearly understood.23 A retrospective analysis of 52 term infants with HIE found that hyperglycaemia occurred frequently but was not associated with an unfavourable outcome.7 Conversely, in a smaller retrospective study, early hyperglycaemia (in univariate analysis only) in infants with HIE was associated with long-term gross motor deficits.10 We previously reported that mild hypothermia was associated with an early increase in mean plasma glucose levels.18 The present study demonstrates that hypoglycaemia as well as hyperglycaemia during the first 12 h were associated with an unfavourable outcome at 18 months age, independent of severity of HIE and cooling therapy. Several limitations of the present study should be taken into consideration. The analysis was post hoc, and so it is important that the findings are confirmed in prospective studies. We do not have glucose values between the predefined time points or continuous values and so may have underestimated the true incidence and duration of hypoglycaemia and hyperglycaemia. However, the study is strengthened by the regular and systematic determination of glucose levels at discrete time points that were not dependent on clinical decisions as in other retrospective studies. Glucose infusion rates from parenteral nutrition and intravenous fluids were not standardised across subjects, and this information was not available for the present exploratory analysis. Further, there was no information regarding treatment thresholds or interventions used, as this was not pre-specified by the original study, whether interventions were provided, or how interventions to achieve normoglycaemia influenced outcome. Thus, the trend of glucose levels towards normoglycaemia over time could represent a response to treatment, or more likely, the natural history of improving glucose homeostasis in infants with moderate-to-severe HIE. We also do not have information on the source (arterial, venous or capillary) of blood samples, and whether different sources of glucose levels could affect interpretation. Future prospective studies are needed to further investigate these associations. Deranged glucose homeostasis was common during the first 12 h after randomisation in infants with moderate-to-severe HIE. Both hypoglycaemia and hyperglycaemia were associated with unfavourable outcome at 18 months of age, independent of HIE severity and hypothermia treatment. Future studies are needed to investigate whether early deranged glucose metabolism in infants with HIE is a biomarker for neuronal injury, has prognostic significance and aggravates further brain injury. We thank the many technicians, nurses, physicians and scientists in the participant sites who contributed to the development and implementation of the CoolCap Study, and the parents who consented to enrolment of their infants in the trial who trusted in us under conditions of great stress and anxiety. We thank the many charities and research funding agencies who supported the preliminary research necessary for the study. The original study was designed by and was the responsibility of the Scientific Advisory Committee (SAC), who had full access to the trial data, and after reading and editing this manuscript, approved the final draft for submission.
. Cerebral metabolism in sheep: A comparative study of the adult, the lamb, and the fetus. Am J Physiol 1975;229:235–9.
. Hypoglycemia selectively abolishes hypoxic reactivity of pial arterioles in piglets: role of adenosine. Am J Physiol 1995;268:H871–8.
. Neonatal encephalopathy following fetal distress. A clinical and electroencephalographic study. Arch Neurol 1976;33:696–705.
. Neonatal hypoglycemia 30 years later: does it injure the brain? Historical summary and present challenges. Acta Paediatr Jpn 1997;39:S7–S11.
. Association between transient newborn hypoglycemia and fourth-grade achievement test proficiency: a population-based study. JAMA Pediatr in press.
. Cerebral carbohydrate and energy metabolism during hypoglycemia in newborn dogs. Am J Physiol 1981;240:R192–9. Collaborators The CoolCap Study Group–Executive Committee: P.D. Gluckman (chair, co-principal investigator), J.S. Wyatt (co-principal investigator), and A.J. Gunn (Scientific Officer). SAC: J.S. Wyatt (chair), R. Ballard, A.D. Edwards, D.M. Ferriero, P.D. Gluckman, A.J. Gunn, R. Polin, C. Robertson, and A. Whitelaw. Data Safety Committee: R. Soll (chair), M. Bracken, C. Palmer, M. Heymann, and A.Wilkinson. Hospital Investigators: J.R. Kaiser (Arkansas Children's Hospital, 11 patients), M. Battin, D. Armstrong (University of Auckland-National Women's Hospital, NZ, 11 patients), J. Khan (Children's Memorial Hospital and Prentice Women's Hospital of Northwestern Memorial Hospital, 3 patients), T. Raju (University of Illinois at Chicago, 1 patient), R. Polin, R. Sahni, U. Sanocka (Children's Hospital of New York-Presbyterian, Columbia University, 18 patients), A. Rosenberg, J. Paisley (Children's Hospital of Denver, 23 patients), R. Goldberg, M. Cotton (Duke University, 14 patients), A. Peliowski, E. Phillipos (Royal Alexandra Hospital/University of Alberta Hospital, 20 patients), D. Azzopardi, A.D. Edwards (Hammersmith Hospital, London, UK, 1 patient), F. Northington (Johns Hopkins University, 2 patients), J. Barks, S. Donn (University of Michigan-Mott Children's Hospital, 12 patients), B. Couser (Children's Hospital and Clinics of Minneapolis, 16 patients), D. Durand (Children's Hospital and Research Center at Oakland, 8 patients), K. Sekar (Children's Hospital of Oklahoma, 4 patients), D. Davis, M. Blayney (Children's Hospital of Eastern Ontario/The Ottawa Hospital, 1 patient), S. Adeniyi-Jones (AI Dupont Children's Hospital at Thomas Jefferson University, 6 patients), T. Yanowitz (Magee Women's Hospital/Children's Hospital of Pittsburgh, 10 patients), R. Guillet, N. Laroia (Golisano Children's Hospital at Strong, 10 patients), N. Finer, F. Mannino (University of California San Diego Medical Center (Hillcrest), 8 patients), J. Partridge (University of California San Francisco Children's Hospital, 2 patients), D. Davidson (Schneider Children's Hospital, 14 patients), A. Whitelaw (Southmead Hospital. Bristol, UK, 13 patients), M. Thoresen (St. Michael's Hospital, Bristol, UK, 8 patients), J.S. Wyatt, F. O'Brien (University College Hospital, London, UK, 4 patients), B. Walsh (Vanderbilt Children's Hospital, 13 patients), J. Perciaccante, and M. O'Shea (Wake Forest University Baptist Medical Center, 1 patient). Manufacturer's Representatives: J. Jones, T. Weiler, J. Mullane, D. Hammond, and J. Parnell (Olympic Medical, Seattle, Washington, USA). Contributors SKB: conceptualised and designed the study, drafted the initial manuscript and approved the final manuscript as submitted. JRK, RG and AJG: conceptualised and designed the study, supervised data analysis and interpretation, reviewed and revised the manuscript, and approved the final manuscript as submitted. CGM and DG: performed data analysis, summarised results, critically reviewed the manuscript and approved the final manuscript as submitted. All authors approved the final manuscript as submitted and agree to be accountable for all aspects of the work. Funding CoolCap study was supported by the Olympic Medical, Seattle, Washington, USA. No funding was received for this post hoc analysis. Role of the funder/sponsor: Olympic Medical supported the original CoolCap Study financially, provided administrative support to the sites, supplied the aEEG monitors and the cooling devices, and monitored initial data recording and accuracy, but had no input into the manuscript. The funding sources had no role in the analysis and interpretation of the data; preparation, review or approval of this manuscript; and decision to submit this manuscript for publication. Ethics approval The original CoolCap Study was approved by IRBs of each participating perinatal centres. Data sharing statement All original data are available with Dr Alistair Gunn and Steering Committee of the CoolCap Study.